Includes surrounding Atlantic and Indian Oceans. Use Edit >> Find, or scroll down, to locate a country of your choice. Previous names for the country are shown in brackets. To find more info, use your favorite search engine with the country name followed by wiki or cia, for example Canada wiki or Canada cia. Click on location map for more detailed map. "Intl Oval" = Oval sign or sticker used to designate vehicle origin, eg: . History French occupation ended 1962. History Portuguese occupation ended 1975. Island offshore Mozambique, administered by France as a nature reserve. The Republic of Biafra was a short-lived secessionist state in southeastern Nigeria. It existed from May 30, 1967 to January 15, 1970. History French occupation ended 1960. renamed 1975. History British occupation ended 1966. Name change 1966. Originally included Mauritius, Seychelles, Chagos Archipelago (main island Diego Garcia). After independence of Mauritius (1968) and Seychelles (1976), only the Chagos Archipelago remains. History French occupation ended 1960. Renamed Burkina Faso 1984. History German occupation ended 1918, Belgian to 1962. History German occupation ended 1918, French/British to 1962. History French occupation ended 1975. History French occupation ended 1960. Languages French, Lingala, Kingwana, Kikongo, Tshiluba. History Belgian occupation ended 1960. Languages Arabic, French, Somali, Afar. History French occupation ended 1977. History British occupation ended 1922. History Spanish occupation ended 1968. 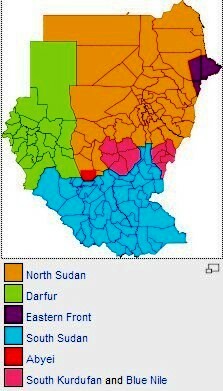 Languages Trigre, Kunama, Afar, Amharic, Kunama. History Italian occupation 1936 - 1941. Island offshore Mozambique, administered by France as a nature reserve. Claimed by Madagascar. History British occupation ended 1966. History Liberia founded in 1847. History Italian occupation ended 1951. Partial ISIL occupation 2014 - present. Language French,Mahoran dialect of Comorian. History Overseas collectivity of France. History French occupation ended 1956. History British occupation ended 1960. Rhodesia (1932 - 1960) Southern Rhodesia, (1960 - 1979) became independent from Great Britain in 1980. It is now the nation of Zimbabwe. History Belgian occupation ended 1962. History Self-governing territory of Great Britain, includes the dependencies of Ascension Island and Tristan da Cunha. History French occupation ended 1960. Briefly part of Mali Federation. History British occupation ended 1976. The Italian UN Trust Territory of Somaliland merged with British Somaliland into independent Somalia in 1960. The former British portion of Somalia seceded in 1991 but is not recognized officially. recognized by any other country. All ceased to exist in 1994 and have all been reincorporated into South Africa. Tangiers was a free zone between 1923 and 1945, and was reunited with Morocco in 1956. History British occupation ended 1961, merged with Zanzibar in 1964. Includes Pemba Island. History Spanish occupation until 1976, annexed by Morocco in 1976. SADR controls only a portion of Western Sahara. The Democratic Republic of the Congo (DRC, DR Congo or Congo-Kinshasa) was known as Zaire from 1971 to 1997. History British occupation ended 1980.